Plant bee-friendly flowers and herbs. Scented herbs such as oregano, thyme, rosemary and lavender are deer-resistant, drought tolerant and bees love them. Rose Mallow, California Lilac, Sedum, and Russian Sage are just a few other ideas. Neighborhood nurseries can help point out bee-licious prospects. Let a few weeds bloom, such as dandelion and blackberry! Dandelions offer early season (late winter) pollen when other tasty, beneficial things aren’t yet in bloom, and blackberry provides great pollen and ultimately, delicious honey. Consider letting an inconspicuous part of the yard go to nature for the bees, if nothing else. Avoid pesticides and herbicides for lawn and garden, especially those containing neonicitinoids, which are toxic to bees and stay in the environment long after use. Any spraying should only be on pest-/disease-affected areas (on windless days) and not during bloom when pollinators are attracted. Garden experts and retailers can offer “neonic” alternatives; learn more at https://www.centerforfoodsafety.org/. Protect honeybee swarms. See a brown ball of bees dangling from a tree branch or bush? A swarm is actually NOT dangerous; it is a family of bees looking for a new home. Beekeepers will gladly collect and house these; find a beekeeper by contacting a local fire department, veterinarian, or nursery. The Puget Sound Beekeepers Association (www.pugetsoundbees.org) keeps a swarm list. Swarms left in the wild have a low survival rate, so housing a swarm greatly increases their chances of thriving. Take action with lawmakers. Be vocal with state and federal lawmakers in support of laws to ban the worst pesticides and support organic farmers, gardeners, beekeepers, and seed savers. Be a hive site host. There are many private properties with easy access for beekeepers and abundant forage; often, urban beekeepers seek out new apiary sites. This is also a hands-off way to nurture an interest in becoming a beekeeper. 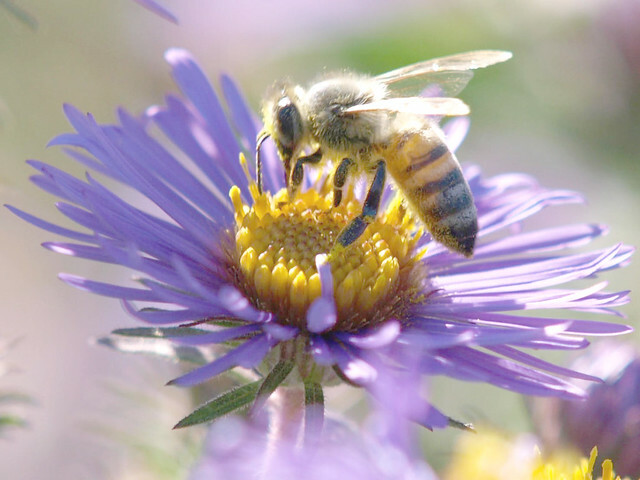 Local beekeeping associations (such as PSBA) can help. Learn about bees and teach kids to recognize and respect them. Bees are essential to our food supply, they sting only in self-defense or to defend their colony. Understand the difference between bees and wasps (including hornets). All play an important pollinating role, but wasps can be more aggressive. Provide a water source. Bees also collect water, and rather than one’s hot tub or dog dish becoming the next great oasis for hundreds of visiting bees, consider floating a few corks (as landing strips) in an out-of-the-way bird bath or fountain. Buy local honey. Real honey supports beekeepers (who are supporting the bees! ), tastes great, and has many healing properties. Buy produce from local farmers, ideally those using no-spray and organic methods. Local farmers provide healthy forage for bees while bees pollinate apples, berries, squash, and much more. If someone is stung, remain calm. Scrape off the stinger sideways without squeezing the venom sac. A paste of baking soda and water will soothe stings. Some swelling is normal, but trouble breathing or abnormal signs throughout the body require medical attention. Special thanks to Bee Friendly Vashon for these and other helpful tips. Bring on summer in the Pacific Northwest, when gardens are in full glory, birds sing from first light into the evening, and pollinators are buzzing from flower to flower. Nature is booming with life. This is the perfect time to help our local honeybees, which work all spring and summer into early fall, to build up for the cold, wet winters that eventually follow.